Having unmatched bets or partially matched bets on the betting exchange is something that the majority of people will experience at some point, when matched betting. And, unless you read this guide, I can almost guarantee you will be hit with blind panic when it happens to you. But relax.. it’s not a big problem as there are simple ways to fix it if it does. As well as ways to avoid it happening in the first place! What is an Unmatched Bet? First we must understand a particular aspect on how a betting exchange works. A betting exchange is essentially a platform where you can offer odds to people on events, as well as take odds that others are offering. So when we place our lay bet, we’re saying I offer these odds and am willing to take a bet up to £X. Usually this is fine, because there are people already lined up waiting for someone to offer these odds and they’re matched with your bet instantly. However, on small events there is less interest in the market and therefore less of a queue, so there may not be enough money available in the market for someone to take the lay bet you’re offering. Therefore the lay bet goes ‘unmatched’ or worse yet only part of your bet is matched (partially matched bets), leaving the remainder unmatched. This is because there isn't anyone wanting to back the bet at the odds you’re offering and the odds increase to the next increment as a result. In the above example, you have placed a £5 lay bet at odds of 5.5. However, none of this has been matched, meaning £5 is unmatched. The amount is red shows the amount that has been matched (£0). It is a bit confusing I find that the red number is the amount matched (rather than unmatched) but just remember that if it's red, it's the amount that has been matched! In the above example, you have placed a £5 lay bet at lay odds of 3.95. However, only £2 has been matched and £3 is shown as being unmatched. In the above example, you have placed a £10 lay bet at odds of 7.0. However, only £4.59 has been matched, meaning £5.41 is unmatched. How to fix Unmatched Bets? Fixing completely unmatched bets - where nothing has been matched yet and your entire stake is still waiting to be matched - is very straight forward. 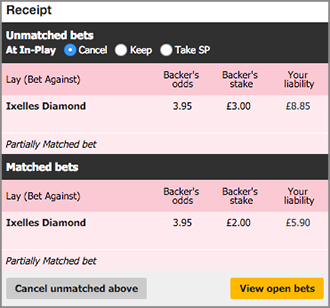 Click ‘cancel unmatched bets above’ - the grey box in the bottom left corner of the betslip (on Smarkets, this is the red cross). Go back to the calculator and re-enter the lay odds to display what they’re now showing on the exchange. Place your lay bet as normal with the new stake amount. Fixing a partially matched bet is a little trickier, but still straight forward with our newly added ‘part lay’ calculator feature! Click the ‘cancel unmatched bets above’ button (on Smarkets, this is the red cross). Load up the calculator and select the ‘part lays’ button in the bottom right corner. This will open up an additional section. In here you will enter how much of your initial stake was matched and the odds it was matched at. Then, keep everything the same in the top bet calculator section as before, changing only the new lay odds. The calculator then shows us exactly how much more we need to lay at the new odds to get it back to the way it should be. Something to note is that because we’re laying on slightly increased odds, the overall profit from the bet will be slightly lower. To avoid this happening in the future you should check how much money is available to be matched on betfair, for that bet, at those odds. It is shown below the odds of the pink box (see below). 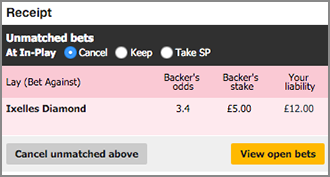 So in this example you can lay a maximum of £2 at the odds of 3.95. So always check how much is available to lay before confirming your bet, else you run the risk of your bet being unmatched or partially matched. Unmatched bets and partially matched bets can create real panic if you don't have much time to resolve it, so make sure you've read through everything in this article and most importantly understood how to avoid it when enjoying matched betting.